Wenceslaus Hollar. Licensed under Public Domain via Wikimedia Commons. 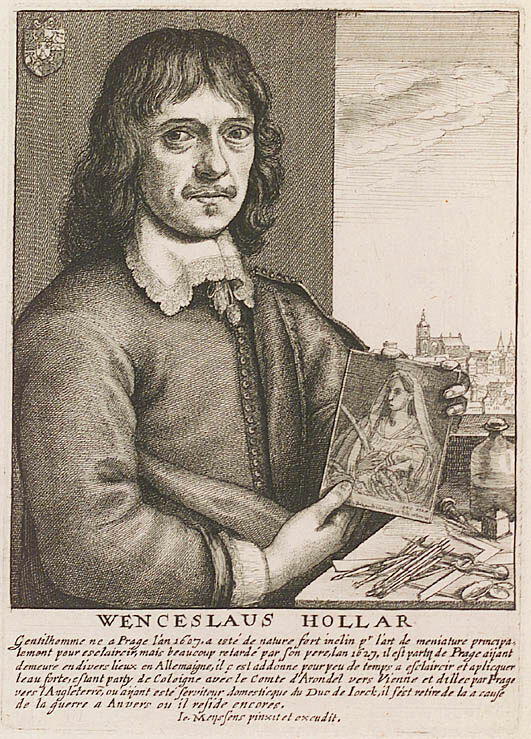 Wenceslaus (or Wenzel) Hollar was born in Prague on 13 July 1607, and died in London on the 28 March 1677. His family was ruined by the capture of Prague in the Thirty Years War, and though originally destined for the law, Hollar was determined to become an artist. A major influence upon Hollar’s work was Albrecht Durer. On 4 July 1641 he married Mistress Tracy, a lady-in-waiting to the Countess of Norfolk. The Civil War caused Lord Arundel to leave England in 1642 so Hollar worked for the Duke of York, and took lodgings at Larkhall, near Stockwell. He served in a royalist regiment during the Civil War and was taken prisoner at Basing House. Somehow he escaped (or was released) and joined Lord Arundel at Antwerp, where he stayed for eight years producing some of his finest work. In 1652 he retuned to London and lived for a time with Faithorne the engraver near Temple Bar. He illustrated several books and also worked for Lambeth resident Elias Ashmole. His employers continued to exploit the simple foreigner by paying very low prices for his excellent work. The Restoration did not improve his position, and in the great plague he lost his son, a promising young artist. After the Great Fire of 1666 he produced his famous Views of London. In 1668 the King sent him to Tangier to draw the town and forts. On his return to England he lived just eight more years during which he etched a scene of the sea battle in which the ship the Mary Rose fought against seven Algerian men-of-war (pirates). He also produced the large plate of Edinburgh (dated 1670) that is widely regarded as one of the greatest of his works. He died in extreme poverty, his last recorded words being a request to the bailiffs that they would not carry away the bed on which he was dying. Hollar was a master etcher and worked on a wide variety of subjects producing some 2,740 plates including views, portraits, ships, religious subjects, heraldic subjects, landscapes, and still lifes in a hundred different forms. His work is still much appreciated by connoisseurs. His celebrated “Views of London after the Great Fire of 1666” is one of the key maps of London from this time.